For the past few months, I’ve been rereading Harry Potter to experience all of the magic over again. Right now, I’m working my way through Harry Potter and the Goblet of Fire. I forgot how many amazing moments were in this book. One of my favorite parts in the whole series is the Quidditch World Cup. I’ll be looking at two chapters in this article, Chapter 7, which focuses on the campsite that the attendees are staying in, and Chapter 8, which focuses on the actual match. One of my favorite things about the Quidditch World Cup is getting to see a little snippet of how wizards live outside of school. It seems like a lot of people went all out with decorating their campsites with three-story tents, elaborate gardens, and even some peacocks. I would not mind camping in one of those tents. How cool would it be to have a tent with an entire apartment inside it? This brings a whole new meaning to the term “glamping.” Another cool thing in this chapter is that we get to see some magical children, a young boy playing with his father’s wand and some girls riding on toy broomsticks. We don’t get to see many examples of children who are too young to attend Hogwarts, and I think it is really interesting to see just how they live their lives before they go to school. 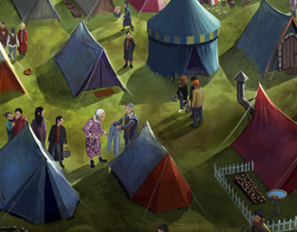 Now, when we talk about these elaborate tents and magical children, we need to keep something in mind, and that is, this is all happening in a Muggle campground. I really love this whole aspect of the Quidditch World Cup. Not only do we get to see witches and wizards outside of school, but we also get to see them attempt to blend in with Muggles. As you can tell, some are doing better than others. When Harry, Hermione, and the Weasley gang first arrive with the Portkey, we see two wizards from the Ministry of Magic who are wearing the most amazing outfits. I kind of want to know if it’s one of the plastic rain ponchos or one of the fabric shirt ponchos. It does not specify in the book and I’m very curious. Of course, we can’t forget about the most important man at the Quidditch World Cup, Archie. He is described as “… a very old wizard who was wearing a long flowery nightgown” (83). Archie is being admonished by a Ministry wizard who is brandishing a pair of trousers at him. Archie refuses to put them on and states, “I like a healthy breeze ’round my privates, thanks” (84). I love Archie so much. He knows what he wants and refuses to be swayed by how other people think he should dress. I also noticed something else that I thought was pretty interesting. There is a sentence about some American witches who had a sign on their tent for the Salem Witches’ Institute. Now, J.K. Rowling has mentioned before that there is no higher education for witches and wizards, and the Salem Witches’ Institute was not on the list of wizarding schools that was released a few years ago, so where did this come from? Who are these witches and what exactly is the Salem Witches’ Institute? According to a tweet by J.K. Rowling from 2015, “The Salem Witches’ Institute isn’t a school, but a joke on the Women’s Institute in the UK.” This is really interesting to think about, but I still think that there could be more behind this. ‘Vell, ve fought bravely,’ said a gloomy voice behind Harry. He looked around; it was the Bulgarian Minister of Magic. This to me is one of the best moments of this chapter. I just love the thought of the Bulgarian Minister of Magic pulling this prank on Fudge because he thought it would be really funny. What is your favorite moment of the Quidditch World Cup? Do you have any theories about what else the Salem Witches’ Institute could be? Let us know in the comments! Mischief Managed! Meet the Parents Who Are Choosing a Magical Way of Sharing Their Love of “Harry Potter” with Their Babies! J.K. Rowling on Twitter: Is She Practicing What She Preaches? Previous story Get Unlimited Access to “Sorcerer’s Stone” E-Book for Two Weeks!